This bouquet of beauties is perfect for any occasion. The bright orange Germinis are superbly complimented by sweet-smelling lilies, orange roses, and russet chrysanthemums. So, whether you want to cheer somebody up or celebrate a happy event, this is the perfect bunch to do just that! This flower arrangement is available for next day delivery. Our Woodbine arrangement pays homage to one the original cottages built within the Barnardo&apos;s village. 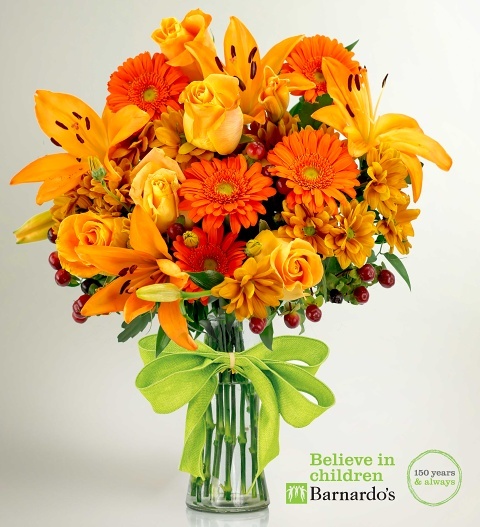 When you select this bouquet, 25% of the total order value will be donated to the Children&apos;s Charity Barnardo&apos;s.